Ski = MC Squared: Trip Report from the Weekend. Trip Report from the Weekend. Right now, Gore is skiing to full potential. Whenever people ask me about the mountain, I tell them to visit during March (because the glades will most likely be open, the crowds will be manageable, and the steeps will be nicely bumped). Well, March has arrived, and the mountain is skiing great. I'll recount the weekend I had, but pictures and words don't really do it justice. You really have to get out there and experience it for yourself. And now is just the time to do it. Friday, we pulled up to the mountain around 8:45 to find all of the lifts closed. So we hung around the bottom, took our time booting up, and rode the double chair when it opened around 10:00. 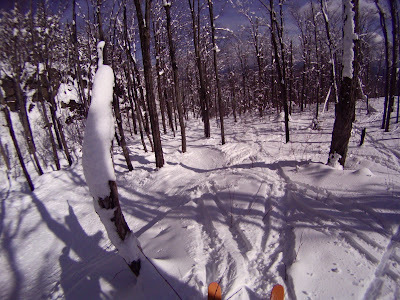 We had taken the day off work hoping for a sweet sweet powder day, and Otter Slide Glades was not what we had in mind. The snow was heavy, grabby, and cementacious. 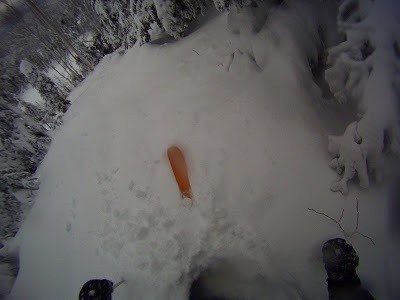 It was reallly tough to power through, even with my 97mm waisted Karhu Jak Tele Skis. When we got back on the trail, the conditions weren't much better. NCP, followed by a groom and a freeze, meant that the lower mountain trails were all iced over hardpack. Not ideal. Luckily, though, when we reached the bottom, they had opened the Gondola. 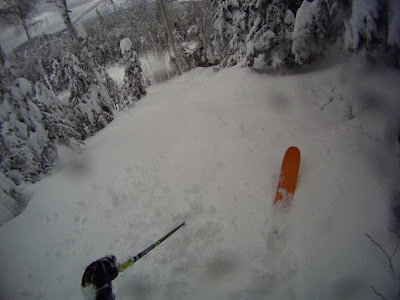 Probably about knee to thigh deep, slightly heavy, super fun powder. Finally, some real positive, really enjoyable skiing. I dropped into Twister Glades on the way down (just to see what it was like), and it was good on top, but quickly turned into that cementy stuff at the bottom. I bailed to Echo, and took another one up the Gondola. Not as deep in the Cave, but still awesome, we moved on to have an awesome day skiing all over the top of the mountain. 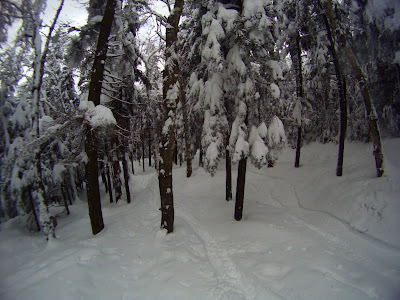 Chati Glades, Straightbrook Glades, Mineshaft, Darby Woods, and a few unmentionables were awesome. We skied straight through lunch, and came in around 3:00 (totally spent) to a nearly empty base lodge with huge smiles on our faces. 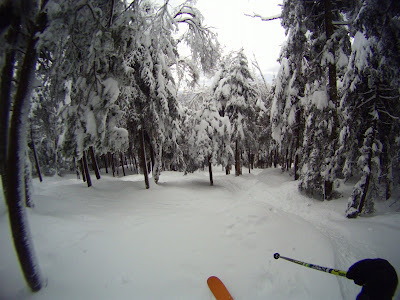 The next day I had to teach, but I must have hit the lottery because it was a Tele Trees and Steeps class. 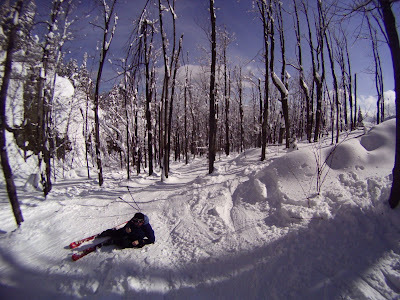 We spent the day on a mountain tour, hitting almost all of the glades and skiing the mountain from the far reaches of the Chati Glades to the Pipeline/Eagle's Nest trail to Burnt Ridge. A lot of learning and A TON of skiing. We came in at 3:45 to a well deserved beer in the raucus Tannery Bar. Beautiful soft spring-like snow, warm temperatures, and sunny skies. Almost total solitude, too. It's amazing how on 3 of the most crowded days of the year, I rarely saw another group of skiers until I got back to the lift. I don't think it was any real skill on my part either. I just think that a lot of people don't ski the woods. And that's perfectly fine with me. 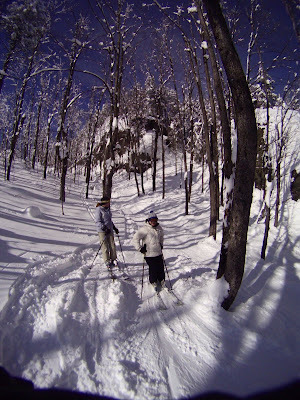 We spent the rest of the day skiing around, but almost all on the Dark Side/Burnt Ridge portion of the mountain. The snow on the Dark Side was particularly Sweet. It has remained cold through the entirety of these last few days, so it's still light and fluffy. Lower Darby was great (soft powdery bumps with nice lines), and the BBA/Hot Damn/Thumper Trio was the best skiing of the day. Overall, it was a fantastic weekend. I don't know if I've ever had a more enjoyable 3 days of skiing back to back to back like that. It just goes to show, if you can somehow find a way to get yourself to the mountain, sometimes everything comes together and life becomes that much better. Matt that is one great report. They quality of the stills coming out of your helmetcam is top notch. To other items of note ... "cementacious" should be added to the dictionary ... and ... great to see you going tele on such an important day. Matt, I love those photos in the Cirque Glade. That weekend is definitely up in my Top 10.